Provide engineering advisory support to developers as owner’s engineer’s role to make sure on the design of power plants is the best. 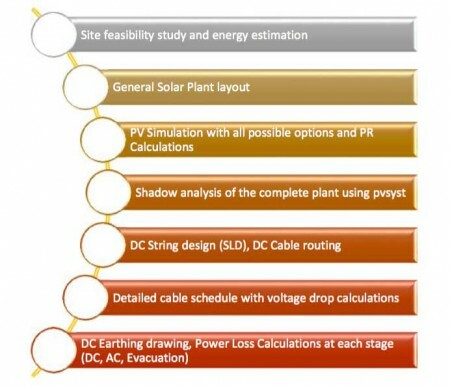 Design support to all capacity of plants starting from small rooftop projects till Multi-Mega Watt solar power plants. Our team consists of a consortium of Renewable Energy System Engineers, Designers and Installers, most of them are recognised as pioneers of the Solar PV Industry. Collectively, we have over 50 years of knowledge, skill and experience as consultants, advisors in the renewable energy environment. 11kV/22kV/33kV/66kv Switch yard design as per standards.